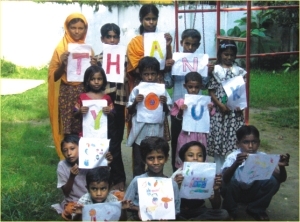 Streetwise is an organizations involving 15 tiny little kids working for a better tomorrow. These 15 kids gather every Friday at 12 pm at a school called Academics, in Gulshan 1. Academics have allowed Streetwise to use their place once a week on Fridays. Once there, these children are given proper nutrition like milk, banana, rice, lentils, vegetables, meat and fish on course basis. Then they are taught enlgish, bangla and art. After that they are taken to the play ground where they play. It is difficult to imagine that these poor kids don't have any space to play as they roam around the bustling streets of Dhaka to sell candy and earn their bread for the day. At their age, our children have difficulty pouring water in glass, whereas those kids are smart enough to earn their living and then go home and provide the family with financial support. These kids make about 80-140 taka per day with which they have to run their family. Their fathers are mostly addicts and mothers can’t take care of the children all by herself. The addictive abusive fathers even beats them and takes away their money mostly when the children show up. Although these children may beg in the elite part of the city, Gulshan; but their life is very different. It is difficult even to imagine for most that with the ethic cuisines and lavish food outlets that has mushroomed in Gulshan over the past few years, these kids only manage rice, onion and chilly. Sometimes not even that. Streetwise has taken the wise step to take 15 kids and work for their lifestyle change. Regarding that, the following is what Streetwise had to say. EDUCATION: In contrast to the already existing madrasahs, orphanages and government run schools that the children frequent on an intermittent basis, we intend to provide them with top-of-the-notch boarding school facility with international education standards. Our goal is a long-term one. Once a child joins the program at age 5 for kindergarten, they will have received 13 years of schooling before they become a graduate of our school and enjoy the benefits and accomplishments of the whole extent of our program. Emphasis on IT and Foreign Languages: We intend to place a strong emphasis particularly on IT and English as a foreign language. These subjects are best introduced when very young and are key to lucrative careers as opposed to the vocational training subjects offered in mainstream schools for street children. We will form alliances with leading IT companies to build the infrastructure for technology centers. Life Skills: This course will not only be a prerequisite on the first year that students join the program and will continue to be a core theme across all units of inquiry. It will consist of interactive activities where students will identify and discuss experiences faced on the streets (ie: poverty, diseases, crime, violence, drugs, injustice and other issues) and come up with ways in which to prevent, cope with and/or overcome them. Art: An important aspect of this program will be devoted to art, as art serves as a bridge between cultures and socioeconomic barriers. Art is crucial, as it can serve as a form of therapy without the stigma. As an example, the use of art therapy both for assessment and therapy of abandoned children in Kiev, Ukraine was noted by Arrington & Yorgin (2001), and Lowry (1995) showed how art can be used to capture the imagination of street children and guide them away from substance use. Similar results were found at the 'Neighborhood Place' in New Haven, CT, an intervention program designed for delinquent children. SW intends to raise the voice of street children in national and international contexts through the art that they create. We plan to employ social marketing strategies by organizing outdoor art exhibitions in the city using billboards to raise awareness in the community, as well as conventional gallery exhibitions, forums and through the sales of art merchandise. The Meal Plan: Students will be offered three meals a day and a snack on a daily basis. Breakfast will consist of whole wheat bread, eggs and a glass of milk. Lunch and dinner will be served hot (rice, daal, vegetables, and poultry, beef or fish) and a snack consisting of a glass of milk and a fruit will be provided between lunch and dinner. The Challenges: There are many obstacles we foresee in launching this program. Given the violent nature of slum environments where crime, drugs and abuse are rampant, guardians oftentimes opt to send their children to work all day, where they know the children will be 'safe', instead of sending them to school, because they have no safe place to go after school. This phenomenon happens more frequently in single-parent families or where both guardians work. In cases where guardians are actually responsive to the idea of sending their children to school, the question of where the child goes after school still remains. That is why the boarding option is a key factor, providing children with a safe place to be after classes. The Incentives :Given the situation, it will be crucial to make a realistic arrangement with the guardians to ensure that they do not hinder their children to attend the program. For this, we will need to offer some important incentives. The fact that the children will be involved in an after school/ boarding program and therefore looked after, may prove enough incentive for some guardians who are concerned with their child's safety in the slums after school hours. Who make Streetwise are, Anita Aparna Muyeed, Nushra Shehzine, Sabina Faiz Rashid, Safia Shamseen Choudhury, Sanjida Sultana, Simeen Sabha, Sonia Choudhury, Yasmin Ahammad and a bunch of 15 little interesting kids.